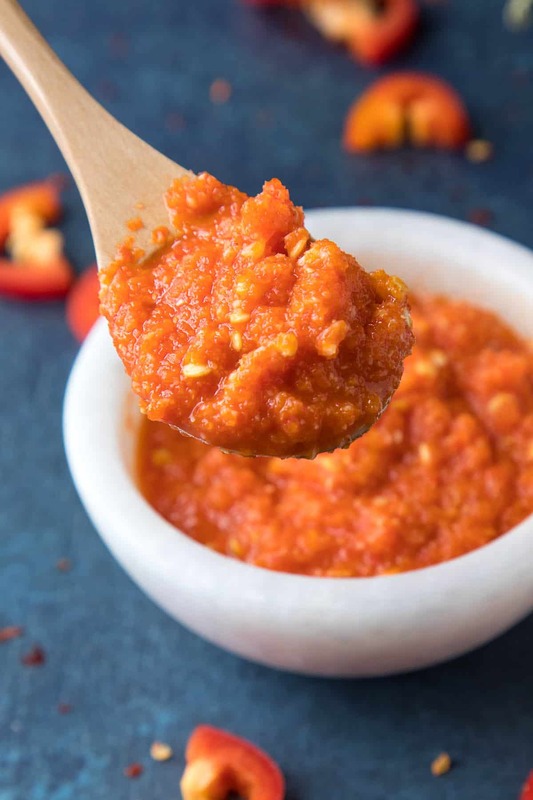 This is an all-purpose, homemade chili-garlic sauce recipe, much like the Asian Huy Fong chili garlic sauce, but freshly made, without preservatives. Super easy to make, and can be used in many recipes. Walking through your typical grocery store, most likely you aren’t going to find many chili-garlic sauces available to you. You’ll probably find “Huy Fong” chili garlic sauce in the Asian aisle, maybe one other competing brand, but that’s about it. Unless you’re in a specialty store, your choices are fairly limited, and specialty stores are few and far between unless you’re living within a fair sized city. 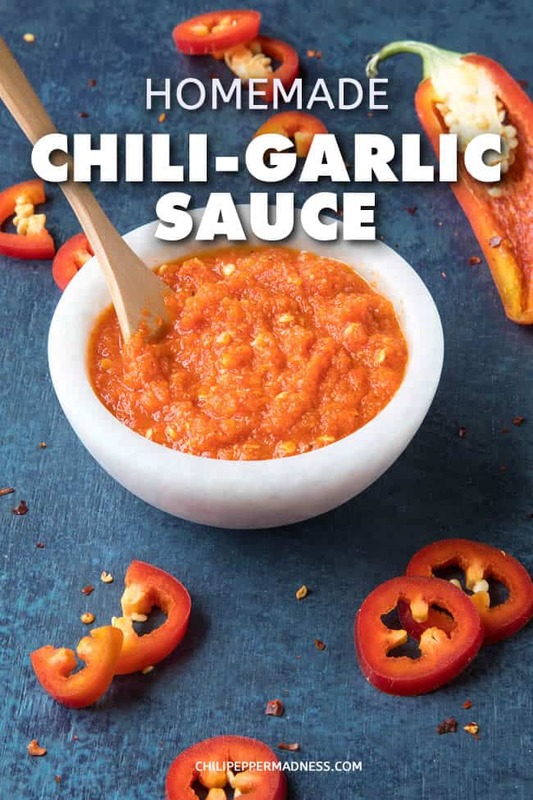 Chili-Garlic Sauce is something I use regularly. 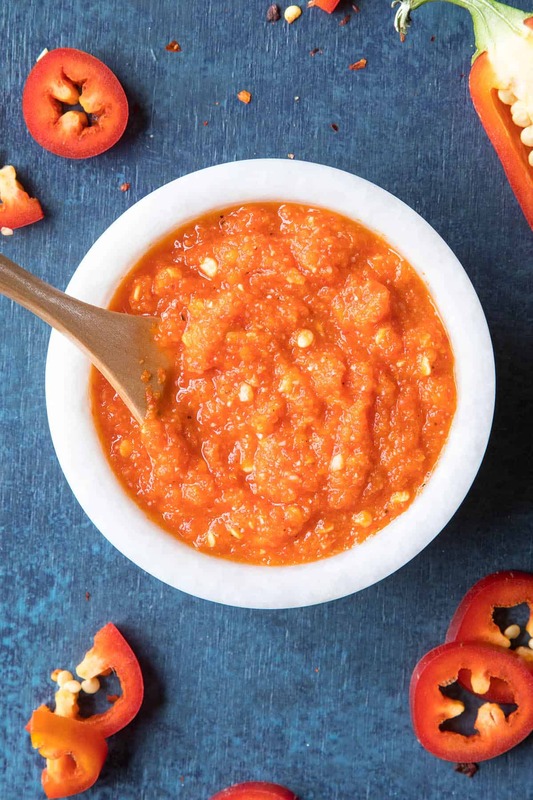 Unlike Sriracha, it is a freshly made sauce, unfermented, and is meant more for cooking rather than a condiment, though it can be used for both purposes. 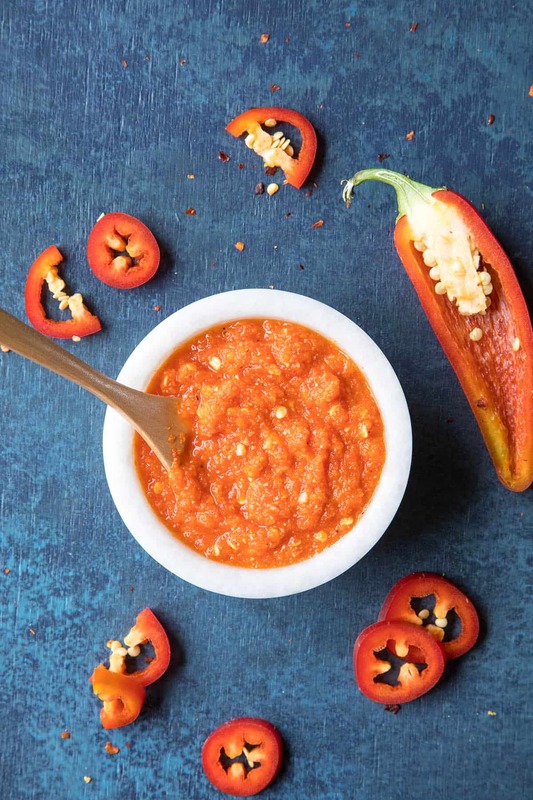 In fact, if you’re out of chili-garlic sauce, you CAN use Sriracha as a substitute, but it isn’t quite the same in texture and flavor. Check out my Homemade Sriracha Hot Sauce Recipe (both fermented and unfermented versions). Sometimes you want one over the other. Lucky for us, we know how to make our own chili-garlic sauce at home on our own. Well, at least NOW we all do! Because here is the recipe. The recipe is simple enough. It uses only 4 main ingredients, aside from salt and pepper – chili peppers, garlic, sugar and vinegar. Let’s make some! First, select and measure out your chili peppers by weight. Four ounces is good. You can choose any type of pepper to make a good chili-garlic paste, though Thai chiles are traditional in some regions. Red, fresh, vibrant peppers are ideal. Consider cayennes, red jalapenos, red serranos, or Fresno peppers to make this sauce. Add the peppers to a food processor along with 4 garlic cloves, 1 tablespoon sugar, 2 tablespoons white vinegar, and a bit of salt and pepper. Next, process to form your sauce. Pour all of the ingredients into a pot and simmer them for about 10 minutes to meld the flavors. Finally, cool and adjust with a bit more salt and pepper to your personal tastes. Store in a sealed jar in the fridge until ready to use. It is best to use the freshest chili peppers available to you, so be sure to check the peppers for blemishes or spots. You can, however, make this with frozen chili peppers as well. Just be sure to thaw them out and dry them a bit with a paper towel before processing. If you have a larger food processor, it is best to make a larger batch so the ingredients can be properly processed. I often make this with medium-hot level chili peppers, though realistically you can make this recipe with any type of pepper. Use sweet peppers for a no-heat version that can still be used in many, many recipes. Go with ghost peppers or above – see my list of superhot chili peppers – for a seriously HOT version. Best case is to use a good variety for both heat and flavor. What Can I Make with Chili-Garlic Sauce? 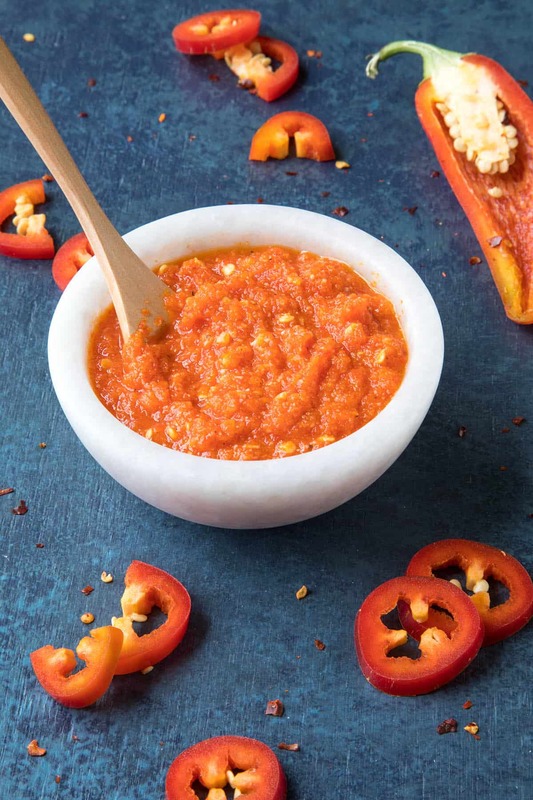 Chili-Garlic Sauce typically lends itself to Asian-inspired recipes, though you can use it in numerous dishes. Here are some recipes to get you started. 4 ounces spicy chili peppers – This works for any pepper of choosing. I used a bunch of Fresno peppers. Use a variety. Pour the mixture into a small pot and heat. Simmer for about 10 minutes. Cool and adjust the flavor with salt and pepper to your tastes. Store in a sealable jar in the refrigerator. Heat Factor: HOT, though it will depend on the peppers used. This recipe was updated on 7/21/18 to include a video and updated photos. Originally published on 5/31/2017. Hi Mike and everyone @ CP????M.. Wanting to make the famed bw2s “Asian zing” wing sauce this morning before work from a recipe i found yesterday, but i didn’t have any garlic chili sauce on hand so improvising like normal in my free remaining 20mins at home, i tried to whip uP something quick….. Not bad, but my AZ needs a few more single origin ingredients.. this recipe from you Mike will go far in my next attempt at the zing sauce, so i thAnk you! Be well and good eats! That’s GREAT, Dannydan. I appreciate it! Glad to help! Hi, how long can the sauce last refrigerated and not refrigerated? REPLY: Khay, if you keep it out of the refrigerator, it probably won’t last more than a week, though much will depend on the final ph of your sauce. Be sure to cover it. I recommend the fridge, where it can keep at least a month or much longer with a bit more vinegar. — Mike from Chili Pepper Madness. Can the sauce be frozen? If so how is the color and texture affected? REPLY: Tamara, yes, you can freeze it. It won’t affect the texture or color, though the sauce may darken a bit with age. — Mike from Chili Pepper Madness. Can this sauce be canned, so that it does not have to be stored in the refrigerator? REPLY: Jill, yes, though you should check the acidity. It would be best to be 4.0 or under for typical canning. If not, you’ll need a pressure canner. Or, just add more vinegar to achieve the proper ph level. — Mike from Chili Pepper Madness.